This is not a drill. 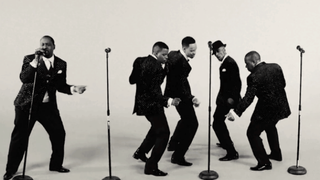 Johnny Gill and New Edition are back, and looking better than ever. The group released the video for the song “This One’s for Me and You,” and it’s definitely reminiscent of the old-school NE sound we loved back in the day. The song is a love letter to the women in their lives, and of course there’s the NE dance moves. You have to give it to them—they still have it. But don’t get too excited; there isn’t a new NE album coming out. The song is from Gill’s upcoming album, Game Changer. In a recent interview with Billboard, Gill spoke about the resurgence of R&B music. “There’s a resurgence of great established and new R&B artists and songs happening. It’s just a matter of us coming together to keep pushing the boundaries; to be respected and get back to a place where people will listen and understand that R&B should not be at the bottom of the totem pole,” Gill said. You can catch Gill and New Edition performing their hits during Tom Joyner’s annual Fantastic Voyage cruise (April 23-May 1).